Officer William Cage (Tom Cruise) is reluctantly enforced to enter combat against an ongoing alien invasion, called Mimics. When he haphazardly kills an alpha mimic, he wakes up the previous morning at the military base, handcuffed. Cage discovers that every time he dies, he wakes up to relive the day again and again. One time, when he saves veteran Rita Vrataski (Emily Blunt), she tells him to 'find her' when he wakes up. Manipulating the time loop he's stuck in, Rita trains Cage and together, they strive to defeat the enemy. From the opening credits, the visual style already gripped me. The way the logos flickered in a glitchy manner to the merging of news stories and background telling. The build up of the story line was quickly executed and we were almost immediately dropped straight into the action. With all time loop films, the handling of the repeat sequence is vital to the pace of the movie. 'Edge of Tomorrow' is slick and allows viewers to piece together the parts of the puzzle opposed to just showing the same footage over and over. Not only this, but the vague passing of time and the unquantified number of repeats Cage goes through gives the movie opportunity to really explore the two leads' relationship. As one remembers every day that they've lived and relived whilst the other lives each day as a new one, there was tremendous potential for something quite dramatic. Glimpses of this surfaced when the two discover a helicopter. Cage stalls Rita knowing she won't make it past this point if they fly it; her questioning him about it in disbelief and resultantly lives out his prediction. Unfortunately, it doesn't go deep enough to truly take advantage of this dynamic and complex relationship. What's more, I praise the movie for only hinting at romance between Cage and Rita. The strength of Rita's character and her role as a leader counters modern day views of women in war. Conversely Cage's cowardice and reluctance to fight is an interesting character trait, which slowly changes as he is trained by Rita. The movie moves predictably through its loops (some super short and funny) to a finale sequence which was visually breathtaking and tense. The only gripe, for me, is the typical return to Hollywood Happy Endings, which this film really doesn't need, and finishes predictably. Nonetheless, an extremely satisfying and solid movie that is a must watch this Summer. 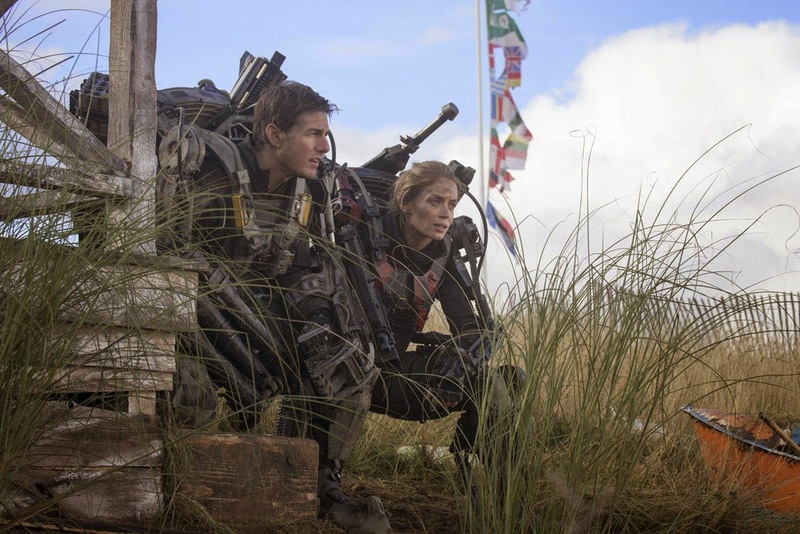 Questions of Tom Cruise's ability to keep making action movies return in 'Edge of Tomorrow', as he struggles to really show a smooth execution of stunts. Praise goes to the pair for working hard in their no doubt, super heavy and sluggish suits. Emily Blunt is delightful as the strong and empowered Rita, who has a consistently determined personality. 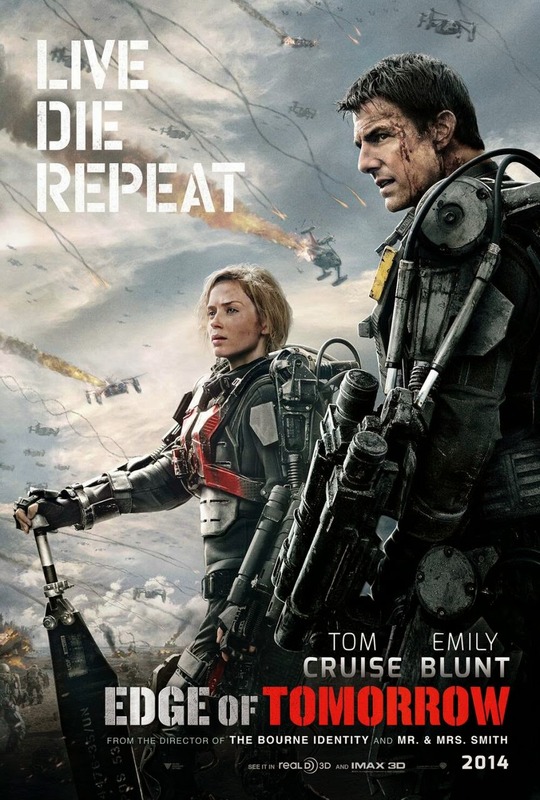 'Edge of Tomorrow' is a pacy, slick and dramatic action movie that is a welcome addition to the time loop genre. The editing makes the movie fun and snappy, keeping you at the edge of your seat. With a few thrills and jumps, it is this Summer's must see action blockbuster.